A bizarre, towards the end very dark tragic comedy about the disintegration of values in a Bucharest family. The protagonists are introduced at the funeral of Niki’s beloved son Mihai: Niki, an old retired colonel, his sickly wife Poucha, his lively daughter Angela and her newly-wed husband Eugen, as well as Eugen’s parents Florian (Flo) and Doina, two modern people in their mid-forties. While Niki is rooted in traditional values – he likes to wear his uniform for family-gatherings, is still called “Colonel” by his neighbours and lives in a small apartment full of memorabilia –, Flo is a full-fledged vegetarian, smartly dressed and interested in “modern” theories that are really rooted in the 70s. He has a computer, a refrigerator filled with delicacies and a Renault he lovingly services. Despite their ideological differences, the two men often stick together – even though the arrogant know-it-all Flo delights in correcting Niki and ordering him around. It is Flo who encourages his son and Niki’s daughter Angela – who still live at Niki’s – to emigrate to the US. Suddenly on her own, Poucha sinks into senile dementia, while Niki is forced to watch the young couple leave and “his family” disintegrate. 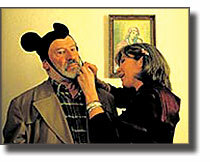 When Flo’s wife literally transforms the two old people into cartoon-characters on her husband’s birthday – also “National Army Day” – the long simmering conflict erupts.